From April 18 to May 6, 2018, a dedicated group of Markham Stouffville Hospital supporters will embark on Trek Everest - a journey from Kathmandu, Nepal, through the Himalayas up to Base Camp on Mount Everest, the highest mountain in the world. This Adventure of a Lifetime celebrates the 65th anniversary of Sir Edmund Hilary's ascent to the top, and will be accompanied by his son Peter Hilary. Funds raised through this Trek will outfit a much-needed Operating Room (OR) at Markham Stouffville Hospital. In addition, this journey will make a difference in helping to rebuild Nepal. While there, medical professionals from our expedition will volunteer at a local hospital recently devastated by a severe earthquake. We hope you will join Trek Everest - Adventure of a Lifetime and make a generous contribution today! I have had surgery, given birth and run a half marathon but trekking to Base Camp Mount Everest is the hardest thing I've ever done both mentally and physically. People told me it would be life changing and that I would not only take a part of the Himalayas home with me, but I would also leave a piece of myself there. I listened to what they said but thought to myself, I’m not really one of those spiritual types. It will be an adventure sure, but it won’t be life changing. I believe it was about day two or three of a 13-day trek that I was tweeting about my life-changing experience. I could blame that on the thin air but the feeling has significantly persisted since coming home to sea level. There are so many experiences that have stuck with me and have reframed the way I think and proceed through my day. I should start with my exposure to healthcare in Kathmandu. 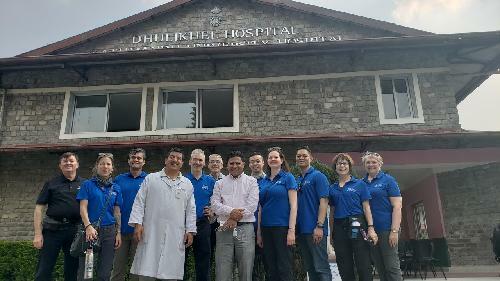 A smaller group of us were lucky enough to spend a week prior to the trek in the city of Kathmandu visiting and touring various hospitals and schools to better understand healthcare in Nepal and also to share our knowledge and expertise. Media were invited to hear from members of our MSH Trek Everest team upon the team's arrival back home. Watch a Q&A posted live on our Facebook page. Thank you for your support! Vlog - Made it to Everest Base Camp! On Tuesday, May 1, 2018 - Markham Stouffville Hospital's MSH Trek Everest team continue their trek and make it to Everest base camp alongside Peter Hillary - son of Sir Edmund Hillary. Everest base camp is located at the foot of the Khumbu icefall and is 17,600 feet! After a long journey that was challenging both mentally and physically - members of the MSH Trek Everest team recap on this great achievement! The little hospital on a hill, in Kunde, about a half-day’s trek from Namche Bazaar, looked simple enough — a handful of sunlit treatment rooms and wards sporting X-ray machines, ultrasound equipment, blood analyzers. Kunde Hospital, the highest care centre in the world, is deceptively humble. In essence, it represents the humanitarian vision of Sir Edmund Hillary come to life. It’s one of the most important success stories in Nepal. After climbing Mount Everest, Hillary dedicated the rest of his life with little fanfare to improving conditions in eastern Nepal. He’d ask the Sherpa what their biggest needs were, then support them in bringing community-led projects to fruition. Before Hillary and the villagers of Kunde built the low-slung hospital building in 1966, nobody there had ever heard of a doctor. Click here to continue reading at yorkregion.com. We’d finished buying puffy jackets and buffs at Sherpa Gear store, and stopped for deep-dish apple pie at Everest Bakery (where the baker is a deaf-mute, and the servers are all orphans the owner has saved from the streets). It was time to burrow back through Namche Bazaar’s warren of cobbled shopping streets to the hilltop Panorama Lodge and Restaurant, where a typical trekker’s dinner awaited — “sherpa stew” of vegetables and potatoes, with small dots of dough dropped in. For centuries until Sir Edmund Hillary arrived in 1953 to climb Mount Everest, the kingdom of Nepal had been a way point on the Silk Road, the vast pan-Asian trading network ferrying spices, silk, or salt from India to China and beyond. It wasn’t exactly sealed to outsiders, but it wasn’t exactly open to them either. Nepalis pretty much ignored the West. [Based on events take took place on April 23] From Lukla, the MSH Trek Everest team began following the classic trail to Mount Everest, ever northward through the midlands of the Khumbu Valley. Farms delineated by hand-built stone walls extended down deep into the valley. They grow potatoes more flavourful than you’ve ever tasted in your life. White beans that melt in your mouth. Sharp, spinachlike greens called “sag.” Barley that the wind ripples and blows flat, giving it the appearance of crushed velvet. And most of these were on our plate, in one form or another, when we stopped for lunch for lunch on the patio of Everest Trekkers Lodge and Restaurant, a tea house owned by Nawang "Nagar" Dorjee Sherpa, Cheplung, a village of around 150 souls where he grew up. Nagar is the Sirdar, or “head Sherpa,” of the MSH Trek Everest expedition. And this trail — alternating between rough-hewn stone, dirt and stony paths — is his birthright as a member of the Sherpa caste, a proud tribe of mountain men who arrived from Tibet generations ago. The area we’ve been trekking through is essentially Main Street for the Sherpas, cutting across the whole of Nagar’s extended community. From Thukla, the MSH Trek Everest team pass through the village and climb up to a viewpoint with stone memorials for climbers who have perished on nearby summits. They will then journey on towards Lobuche as they get closer to Everest Base Camp. Here is a close up view of the stones with MSH Foundation's Allan Bell. The MSH Trek Everest continues along the rushing glacial waters of the Dudh Kosi with magnificent views of the mountains. The team spends the night next to the Thyangboche monastery, the spiritual center of the Khumbu region. Inside the monastery are incredibly ornate wall hangings, a 20 foot sculpture of Buddha, and the musical instruments and robes of the Lamas. MSH Foundation's Allan Bell talks us through the experience. The MSH Trek Everest team continue trekking along the banks of the Dudh Kosi, crossing this majestic river many times on exciting suspension bridges laden with prayer flags. After entering Sagarmatha National Park, the trail climbs steeply with breathtaking views to Namche Bazaar, the gateway to the Khumbu region. "It was the second hardest trekking day but surrounded by an amazing group of people who all have each other's backs. We've quickly become a high functioning team," says Barb Steed, Executive Vice President, Patient Services & Chief Practice Officer at Markham Stouffville Hospital. After an 8 hour trek here, the group will spend two days in Namche to help acclimatize. The MSH Trek Everest Team fly on a twin-engine Otter to the Himalayan foothills where they officially begin their trek into the Khumbu region. The views from the plane are amazing, providing dramatic views of terraced hills and the distant Himalayan giants. After landing in the village of Lukla (9,350 feet) they trek for about two and a half hours to Phakding. Bodhnath Stupa is one of the most holiest Tibetan Buddhist sites. Built by Sherpa tribes originally from northeastern Nepal and Tibet, was a reminder of the Everest region where the MSH Trek Everest team are headed next. Allan Bell of MSH Foundation shares their experience. The contents of luggage and three large duffels had been laid out on a table. Inside were sticker books, craft supplies, memory and card games, bouncing balls, and Oxford Canadian Dictionaries. But it was the magic markers something the children of Phaplu Community School had never seen before that had speech language pathologist and Clinical Manager of the Child Development Programs at Markham Stouffville Hospital (MSH), Trisha Lawless in tears, for only the third or fourth time that morning. “Knowing that you’d given children something entirely new to discover and learn with was very special,” said Lawless. Each child received a ruler, and some writing and drawing supplies like crayons. And each of the school’s seven classrooms was given a world map, which the children helped blue-tack to the walls. They were soon crowded around the maps -- they’d never seen those either. 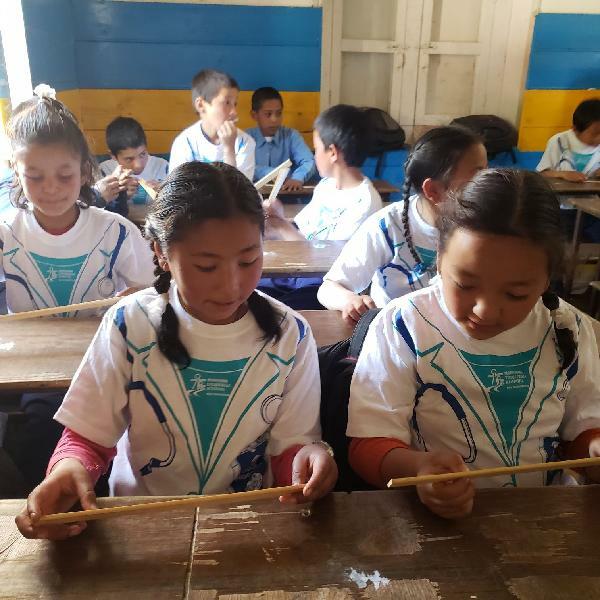 MSH volunteers had flown the night before from Kathmandu to Phaplu, a village within the 3,312-square-km Solukhumbu District, where Mount Everest lies. Susan Sheffield, MSH’s Director of Child Development Programs, along with nurse practitioner Stephen Ng, family physician Dr. Eileen Lougheed and retired school principal Brandon Lougheed rounded out the group. Lines of fluttering coloured flags radiated from the gilded sceptre of the Swayambhunath down to the ground, where believers circled its whitewashed dome, running their fingers over carved wooden prayer wheels as a gentle chorus of Om Mane Padme Hum piped over the loudspeakers. From slanted pagodas or trees, the goings-on were observed by residents that give this complex of Buddhist and Hindu shrines and stupas its nickname: The Monkey Temple. A few kilometres distant from the hillside perch, we could see Kathmandu expanding in a chaotic patchwork over the bowl-shaped dip of a primordial lakebed. 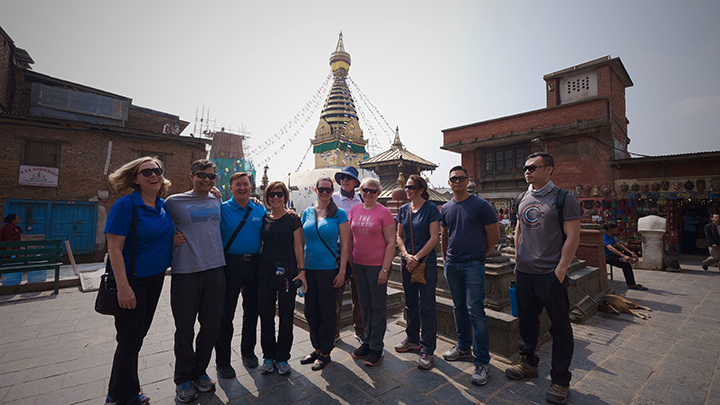 The city has about 2,700 important religious and cultural sites including seven that collectively amount to a UNESCO World Heritage Site and the MSH Trek Everest team have had a chance to visit some of its main tourist highlights. At Pashupatinath, a precinct of 293 Hindu temples, shamans with their faces painted in kaleidoscopes of colour were taking rupees for photographs with tourists. Meanwhile, on the opposite bank of the Bagmati River, mourners were cremating bodies on pyres, sending their loved ones on a final journey of purification downstream, to the Ganges in India. “There’s a spiritual connection that you feel as a Hindu in this place,” said Markham Stouffville Hospital radiologist Dr. Mitesh Mehta, emerging from the main pagoda-roofed temple dedicated to Lord Shiva, Pashupati, the Destroyer. His father visits a similar temple in Toronto, offering milk that cools the fiery deity, he said. On the morning of May 29, 1953, at 11:30, Sir Edmund Hillary and Tenzing Norgay finally stood atop the 29,028-foot summit of Mount Everest, looking down. They hugged, shook hands, planted flags. For the rest of his life, the New Zealand-born mountaineer returned over and often to Nepal, where he helped build the first two airstrips that opened up tourism to Mount Everest, along with bridges, hospitals and at least 17 schools. He also urged protection of forests surrounding the mountain that became the country’s first national park. Our MSH Trek Everest team have embarked on a journey through the Himalaya to Everest Base Camp at 17,598 feet. Peter Hillary has joined the trek, in honour of the 65th anniversary of his father’s first ascent of Mount Everest and later decades of humanitarian accomplishment. Peter joins the group to tour Kathmandu town - this is a glimpse of that experience. The MSH Trek Everest venture to visit hospitals and medical clinics in Nepal and learn how health care compares to Canada. Markham Stouffville Hospital Foundation's Allan Bell and Markham Stouffville Hospital's Clint Atendido take us on this journey. When four-year-old Siddhi Sundar Dhaubhadel was struck and killed by a jeep on his way home from kindergarten, Shyam Sundar and his wife Ranjana Dhaubhadel lost their only son, the one person who could have carried on the family name. It was a cruel blow, compounded by the tragedy that Siddhi’s injuries might have been survivable had there been a hospital close by. The nearest was in Kathmandu, only 15 kilometres from their hometown of Bhaktapur, which meant a two-hour drive through choking traffic. Within weeks, the couple had donated family land to open a private medical clinic bearing their son’s name, and by 1997, this had expanded into Siddhi Memorial Hospital for Women and Children. Have you previously donated to or fundraised for Markham Stouffville Hospital Foundation? Log in below with your username and password.